Most email providers allow you to access your email using several email protocols. The most commonly used protocols are POP3 and IMAP4. Understanding how these protocols access your mailbox is an important step in managing your email. You often see these expressions used but these are somewhat misleading as a mailbox is neither POP3 or IMAP4. Is Gmail POP3 or IMAP? Is my Mailbox POP3 or IMAP4? 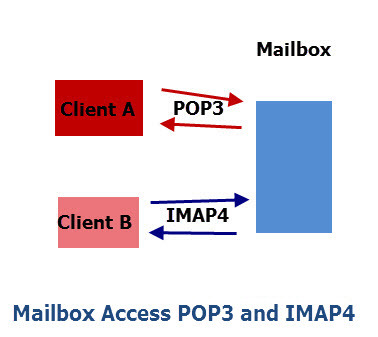 POP3 and IMAP4 are access mechanisms, and a Mailbox can support access via either and, or both protocols. For example I could configure two email clients to access the same mailbox. One could use POP3 and the other IMAP4. How well the above configuration works in practise depends on how the POP3 client is configured. 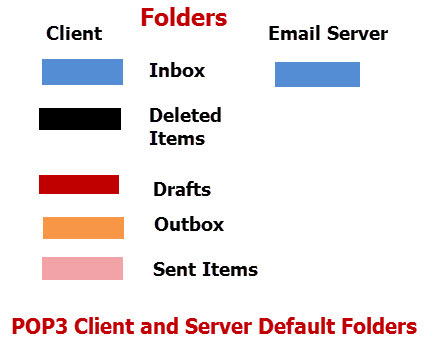 POP3 was designed when mailbox storage was limited and so it was designed to move email from the server to the client. POP3 can only access the inbox. IMAP4 was designed as server based email meaning all email is stored on the email server. 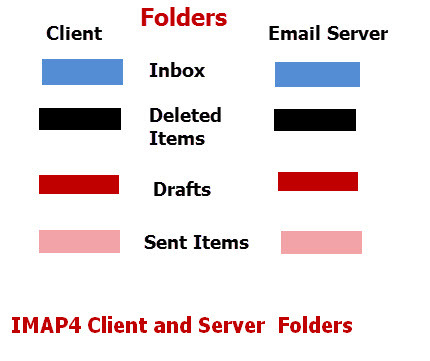 IMAP4 clients can access any folder and not just the inbox. Because POP3 Moves email from the server to the client then all of your received Email will be on the email client (normally your PC). This makes it difficult if you need to access your mailbox via several clients e.g. your PC and Mobile Phone. Because POP3 can only read email from the inbox all of the email that you send is stored on your local client (normally your PC). If you use two clients to access the same mailbox using POP3 then any email sent from one client is not visible to the other client. Deleted Items – Deleted items are kept here until permanently being deleted when you empty it. Drafts– Unfinished emails can be stored here. When you receive email from the Internet the email is transferred from the inbox on your email server to the inbox on your client machine and then deleted from the email server. Any new folders that you create exist only on your client machine. Because IMAP4 stores all email both sent and received on the email server then you can access the email using any IMAP4 or Webmail client without any special precautions. If we look at the folders on the email client and server for a mailbox using IMAP4 we see a completely different picture. In this case the folders on the email server are the same as the folders on the email client. The inbox on the email server contains the same messages as the inbox on the email client. The sent items folder on the email server contains the same messages as the sent items folder on the email client. Most email clients only synchronise the inbox by default. as shown in the screen shot below for an IMAP mailbox on Outlook Express. Both protocols support SSL encryption and most email clients can use IMAP4 and POP3 over SSL. SSL uses different ports than the standard POP3 and IMAP4 ports so you need to check what port your email provider uses. I’ve been using POP3 for many years what happens if I switch to using IMAP4- Will I lose my old emails? – No See moving from POP3 to IMAP4 . It is usually possible to access a mailbox via several access protocols. Accessing using POP3 is an old and outdated access mechanism and should be avoided if possible. If you are current accessing a mailbox using POP3 it is possible to switch to IMAP4 and retain your emails.